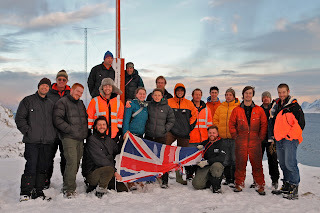 The Rothera 2012 wintering team at sun-down with what is left of our flag. At sun-up Scott (the youngest member of the team) will raise a new flag. From left to right: Dr Rob doc, Dave, Tom, Phil, Jacko, Dale, Steve, Muzza, me, Jack, Ash George, Scott, Mr Boat, Ash, Greendog, Justin and Adam. Thanks very much to Adam for the great photo.